The scheduled October 23rd Jr. Middleweight fight between former world champions Shane Mosley and Anthony Mundine seems to be the latest well-matched bout in what has been a stellar year for the sport of Boxing. The fight that is scheduled to take place at the Sydney Entertainment Centre in Sydney, Australia presents a couple of interesting storylines. For Shane Mosley who returned to the ring following a brief retirement in May of this year scoring a twelve round unanimous decision over welterweight contender Pablo Cesar Cano, this fight could represent a chance to get back in the hunt for another world championship. Likewise for Anthony Mundine, who is coming off a decision loss in his rematch with former IBF Middleweight world champion Daniel Geale in January of this year, the fight with Mosley one might argue represents the biggest of his career. One might also argue that it is Mosley who might have more prove than Mundine. There is no disputing that Shane Mosley has had a great career and is a first ballot Hall of Famer. The former five-time world champion in three different weight classes however, has only won one out of his last five bouts and prior to his fight with Pablo Cesar Cano appeared to show signs of a great champion who’s best days were behind him. After an impressive performance in what was a closely fought battle with Cano, it will be interesting to see if Mosley can build on the momentum off of that fight against a fighter in Mundine who has the ability to be elusive, give angles, and may perhaps rival Mosley when it comes to hand speed. Mosley however, may have the edge when it comes to power. Mundine, a two-division world champion in his own right has been one of Australian Boxing’s superstars for many years. Mundine however, has not had a career defining victory over a marquee superstar of the sport. Mundine who has called out Floyd Mayweather in the past might be looking at this fight as a potential opportunity to enter the discussion of potential opponents should he win against Mosley and, should Mayweather be victorious in his bout with Saul Alvarez. Much as there are questions about Shane Mosley heading into this fight, so too are questions about Anthony Mundine. In his last fight Mundine was outworked over the course of twelve rounds by Daniel Geale. Although Mundine was able to have sporadic success in that fight some questioned the then thirty-seven year old Mundine’s future in the sport following the loss. Mundine however, will be the younger of the two fighters when the now thirty-eight year old fights Shane Mosley who will turn forty-two on September 7th. It will be interesting to see who will attempt to dictate the pace of this fight. In his last fight, Shane Mosley was able to rally in the middle and late rounds to earn a unanimous decision over Pablo Cesar Cano. Most observers however, this one included believed that Cano had won the early rounds. In contrast, in his rematch with Daniel Geale; Mundine did not let his hands go with consistency. This allowed Geale to win rounds by being more active and landing the cleaner punches. For both fighters at similar stages in their careers it will be interesting to see who initiates the action and whether or not the fighter who dictates the pace initially will be able to maintain that pace for a twelve round distance. One could make a valid argument that this fight presents a scenario of two former world champions at a crossroads. The winner is perhaps likely to find another opportunity at a world championship down the line, while the loser may be likely to retire. There was some doubt last week however, as to whether the fight would take place. It was reported that Mosley had threatened to pull out of the fight claiming that Mundine owed him $300,000 in agreed payments. While in attendance at an official media day for Saul Alvarez, who is in training for his upcoming bout with Floyd Mayweather on September 14th, Mosley stated to Boxingscene.com quote “I’m supposed to fight Anthony Mundine but they’re having money problems . . . sending money to escrow, so that fight might not happen. If they can’t put a measly $300,000 into an escrow account until we fight then how are we going to fight for the money they’re talking about? We’re having problems (and) I don’t know what’s going to happen. That fight is really not a go. It’s not like I’m going to be fighting Anthony Mundine on October 23." 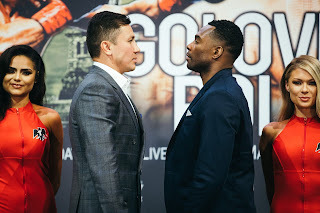 This situation reminded me of a similar situation with regard to a fight falling through over money in what was a highly anticipated bout between former Heavyweight champions Larry Holmes and George Foreman which was scheduled to take place in 1999. The bout which was to take place at the Astrodome in Houston, Texas was ultimately cancelled due to the promoter of the fight failing to meet deadlines on payments to both fighters for their respected purses for the bout. The Holmes-Foreman bout never took place. It appears that the situation involving money with regard to the Mosley-Mundine bout has been resolved as both fighters appeared at a news conference in Los Angeles last Friday to formally announce the fight. The eyes of the Boxing world will set their sights on Sydney, Australia on October 23rd. Although there is likely a difference of opinion in regard to what Mosley and Mundine both have left to give as fighters, this fight appears to be well-matched and realistically probably the best fight out there for both men at this stage in their respective careers.